While it'd be good if the internal sun visor came down more, it leaves quite a gap, you soon get used to it and it doesn't distract too much. It has to be said - this is a hot helmet! The airflow with the vents open is OK but it doesn't do enough to keep you cool. It'll be interesting to see how it goes in the winter! Generally a good comfortable helmet but might be worth holding out for the C4. The C3 Pro Women features plush cheek padding specially contoured for a woman's narrower jawline and higher cheekbone. The ruby coloured fabric is made of special micro-fibre material that is antibacterial, hypo-allergenic and is easy to clean. The C3 has evolved into the C3 Pro. Improvements over the C3 include a new spoiler for improved aerodynamics for high speed riding making it the first flip-up ever to also be a good choice for the sports rider. Directionally stable with no drifting and no buffeting. Quietness is taken to another level thanks to its integrated acoustic collar giving just 82dB(A) at 100 km/h on a motorcycle without fairing. The neck band is made from abrasion-proofed materials with a higher air out take thanks to bigger mesh fabric. Two-way-ventilation provides up to 9 litres of fresh air per second. Integrated into the helmet are two antennae for a higher range (up to 700 metres) and optimized FM-Radio reception. 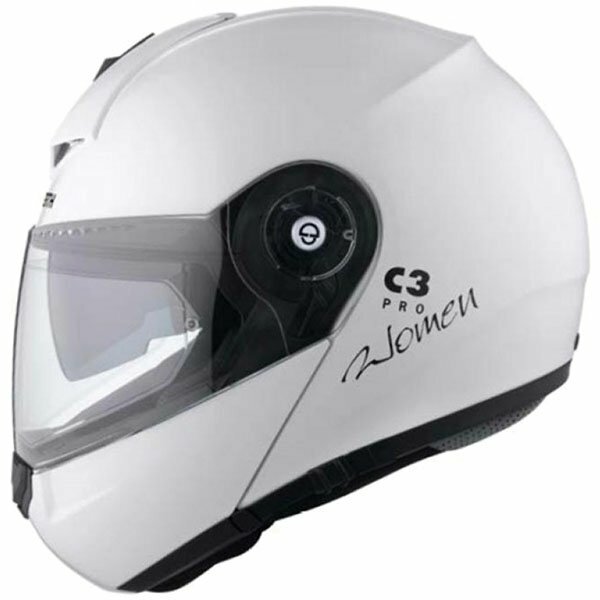 Prepared for the Schuberth Rider Communication System, the specific C3 Pro SRC-System available separately. SHELL CONSTRUCTION - The outer shell of the C3 Pro Women is offered in one shell size and is constructed using a special glass fibre reinforced with a special resin which is vacuumed at high pressure to ensure a low weight yet exceptionally sturdy outer shell. VISOR SYSTEM - The C3 Pro Women visor is installed and removed without tools and condensation is eliminated thanks to Pinlocks double glazing technology. 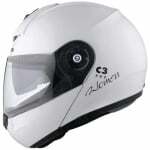 AERODYNAMICS - The C3 Pro Women is specially set for the riding posture of motorcyclists on tourers and sports tourers. Thanks to its advanced aerodynamics there is no upward lift. ACOUSTICS - All Schuberth motorcycle helmets are developed and optimised under scientific conditions in the Schuberth wind tunnel. The reduced noise level assists the rider's concentration and attentiveness. Thanks to the anti-noise technology used in the C3 Pro Women noise within the helmet is limited to Only 82dB(A) at 100 km per hour (on faired bikes). SRC SYSTEM READY - The C3 Pro Women is by default equipped to accommodate the Schuberth SRC System C3 Pro. To guarantee ideal radio reception the C3 Pro is already equipped with two integrated antennas to boost reception and a Bluetooth connection. AIR VENTILATION - The C3 Pro Women is equipped with an innovative ventilation system. The combination of multipath channels in the EPS foam shell and the head, chin and mouth ventilation ensure that fresh air is distributed efficiently throughout the entire head area. CO2 VENTILATION - The concentration of carbon dioxide inside the helmet is a key safety factor for preventing symptoms of fatigue and the thinning of breathable air. The Schuberth C3 Pro Women helmet guarantees that the CO2 concentration remains below the workplaces maximum limit of 0.5%. Schuberth motorcycle helmets are, and always have been, developed and manufactured using a quality oriented approach. Since the late 1970's, Schuberth have specialised exclusively in the production of head protection technology, cementing their position today as THE motorcycle helmet specialist. As well as motorbike helmets, Schuberth also design and manufacture helmets for the police, fire service, military and other areas of motorsport, most famously for use in Formula 1. The fact that Michael Schumacher has chosen to work with the brand for so long speaks volumes about its pedigree, and the company's commitment to the development of helmet technology. This commitment is made further apparent by the fact that Schuberth are the only bike helmet manufacturer in the world with their own acoustic and wind tunnels. Via their base in Magdeburg, Schuberth are, quite rightly, proud to promote their "made in Germany" message and now export motorbike helmets to more than 50 different countries throughout the world.